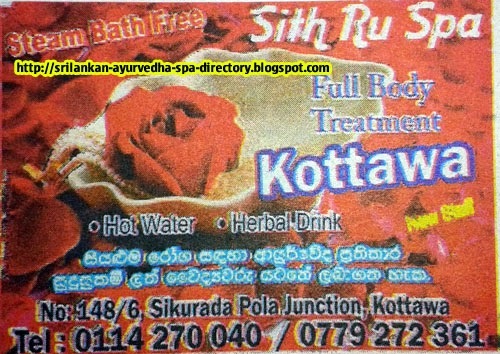 Sri Lanka Massage Places and Ayurveda Spa's Information Directory: Sith-Ru Spa and Body Treatment Center - Kottawa. Sith-Ru Spa and Body Treatment Center - Kottawa. Sith-Ru Spa and Body Treatment Center, No.148/6, Sikurada Pola Junction, Kottawa. Foot spa massager therapy is relay healthy for our health.It can used to relieve pain on our foot and leg.APain relief foot massager safely activate the natural pain blockers of the foot and leg. This makes this massager a very outstanding substitute to drugs or after surgery.